Canada saved the asbestos industry when it was headed for extinction in the early 1990s by targeting developing countries as new markets to which it could export asbestos. Latest figures show that global asbestos exports increased from 1,081,885 tons in 2011 to 1,327,592 tons in 2012. Over a century ago, in 1898, factory inspectors in the UK noted that asbestos was causing lung disease and death amongst workers. Yet use of asbestos continued. Between 1930 and 1980, sales soared in the industrialized world, reaching a peak of almost five million tons a year by the early 1970s. This was in spite of the growing realization that asbestos was causing workers to die not only of asbestosis, but also mesothelioma and other cancers. Occupational health and safety rules were weak and frequently not enforced. In addition, the industry suppressed the evidence of harm to workers’ health that its own company doctors were seeing. And for the most part, companies controlled the medical evidence. As late as 1972 Johns-Manville, the world’s biggest asbestos company, which operated asbestos plants in Canada, had a corporate policy of not telling employees when their medical examinations showed they had asbestosis. Johns-Manville’s corporate lawyer, Ivan Sabourin, even smuggled x-rays and lung samples of Quebec asbestos workers across the US/Canada border, in order to hide evidence of disease and to avoid payment of compensation. Minutes of a meeting of top Johns-Manville executives, attended by the Chair of McGill’s Department of Epidemiology, Prof. John C. McDonald, recount how they plotted to suppress medical information recorded by a company doctor, which showed higher levels of disease being caused to workers than previously recognized. Johns-Manville wanted this information suppressed, as it feared this disturbing evidence would trigger demands for stricter health and safety measures, which would cost the company money. By the 1980s, however, in the face of epidemics of asbestos-related diseases, the asbestos industry could no longer cover up the harm asbestos was causing. Consequently, toward the end of the 1980s, global asbestos sales plummeted dramatically from close to 5 million tons a year to 2 million tons. The market for asbestos in industrialized countries had collapsed and the industry seemed headed for extinction. Canada, however, was determined to save the asbestos industry. With funds from the Canadian and Quebec governments and the Quebec asbestos mining companies, Canada in 1984 created the Chrysotile Institute, with the specific aim to create new markets for asbestos in developing countries. Along with upbeat propaganda, and sanctified by the Canadian flag, the Institute claimed that asbestos can be safely used. Using millions of dollars of taxpayers’ money and exploiting Canada’s international credibility, the Chrysotile Institute travelled the world and succeeded in creating new markets for asbestos in Asia, Latin America and Africa. It also helped set up asbestos lobby organisations inside these countries. In addition, Johns-Manville and other asbestos mining companies formed the Quebec Asbestos Mining Association and set up an industry front organisation (the Research Institute Of Occupational Health), which gave a million dollars to McGill University’s Department of Epidemiology & Health to carry out research on the companies’ workers. Like all research financed by the asbestos industry, this research came up with industry-friendly results that supported the industry’s propaganda claiming that chrysotile asbestos was “virtually innocuous” and could be “safely used”. The chair of McGill’s Department of Epidemiology & Health, Prof. J. C. McDonald, used his status and the status of McGill to promote the use and export of chrysotile asbestos. The asbestos industry thus succeeded in halting the precipitous drop in its sales and, for the past twenty years, has maintained production at around two million tons a year. The world production figure for 2012 is estimated at 1,987,800 metric tons. The figure for 2011 was 2,034,700 metric tons. Of the 2,034,700 tons mined in 2011, the industry exported 1,081,885 tons to other countries. Shockingly, the figures for 2012 show that global export of asbestos has increased to 1,327,592 tons – an increase of more than 20%. The asbestos industry hired the same public relations company and copied the tactics that the tobacco companies successfully employed for decades: deny the scientific evidence, create doubt, fight government controls aimed at protecting health, and threaten scientists who expose the truth. As well, like the tobacco companies, the industry targeted the developing world as a rich opportunity for profits for a deadly product. An essential part of this strategy has been to cover up the hazards of asbestos. This strategy has been threatened by the UN Rotterdam Convention, which seeks to control trade in hazardous substances. The Convention specifically requires Prior Informed Consent, which means no cover-up of hazards. Once again, Canada played the role of global protector of the asbestos industry. Even though chrysotile asbestos is a hazardous substance under Canadian law, Canada has refused for the past ten years to allow it to be listed as a hazardous substance under the Rotterdam Convention, thus allowing asbestos to be exported with not so much as a warning, let alone safety controls. After the new Parti Québécois government refused to give financial support to the asbestos industry, causing the last two Quebec mines to shut down, the Harper government announced that it would stop blocking the listing of chrysotile asbestos under the Rotterdam Convention. The reason for this change of position has nothing to do with health. The Harper government still denies the science on asbestos and allows asbestos-containing products to be imported into Canada. The reason given by Harper’s Quebec lieutenant, Christian Paradis – a long-time political ally of the asbestos industry – is that, since Canada is no longer exporting asbestos, there would be no point in Canada blocking the listing of chrysotile asbestos under the UN Convention. Canada’s position sends a sordid and cynical message to the world: base your international policy on protecting industry’s profits, not on protecting human health. Russia is the world’s biggest asbestos exporter by far. Of the total 2 million tons of asbestos mined globally in 2011, Russia produced 1 million tons and exported most of it. The latest figures for 2012 show that Russia’s export of asbestos increased from 748,564 tons in 2011 to 844,823 tons in 2012. In other words, Russia used less, but exported more of the asbestos it mined. Russia plans to take over the role that Canada has played for so long: deny the scientific evidence and sabotage international safety requirements. Both overseas and at home, the Canadian government has acted as an enemy of health protection, human rights and scientific integrity. Our public policy has been corrupted by the asbestos industry. We have caused enormous harm around the world and here in Canada, and asbestos-related deaths continue to rise. Figures just released in Quebec show that in 2012, over 80% of deaths of workers from occupational disease were caused by asbestos. Yet the Canadian government continues to turn a blind eye to the scientific evidence and to the human tragedy at home and abroad. The Harper government rejects the recommendations of the Canadian Medical Association and the Canadian Cancer Society and instead supports asbestos industry propaganda that asbestos should continue to be used. The government fails to take safety measures to protect federal workers from asbestos harm and is indifferent to the plight of workers exposed to asbestos because of the Canadian government’s unconscionable negligence. Every Canadian has a role to play in challenging and ending this destructive, irresponsible conduct by our government, which is a shameful betrayal of our most basic value as Canadians: do not harm others. 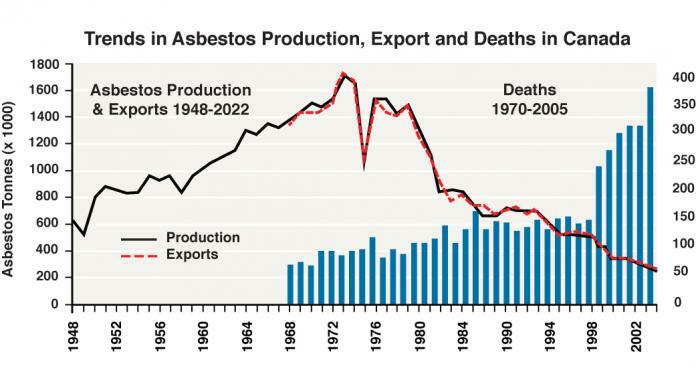 Canadian production and export of asbestos has declined since the 1970s but has not ended, despite the known risks the mineral poses to human health. Figure created with data from the Vital Statistics Database and the Canadian Mortality Database, Statistics Canada and Statistics Canada and Natural Resources Canada, Mineral Production in Canada, 1948-2002. To keep up with industrial demand, asbestos production in Canada increased dramatically in the 1950s and continued increasing throughout the 1960s and early 1970s. 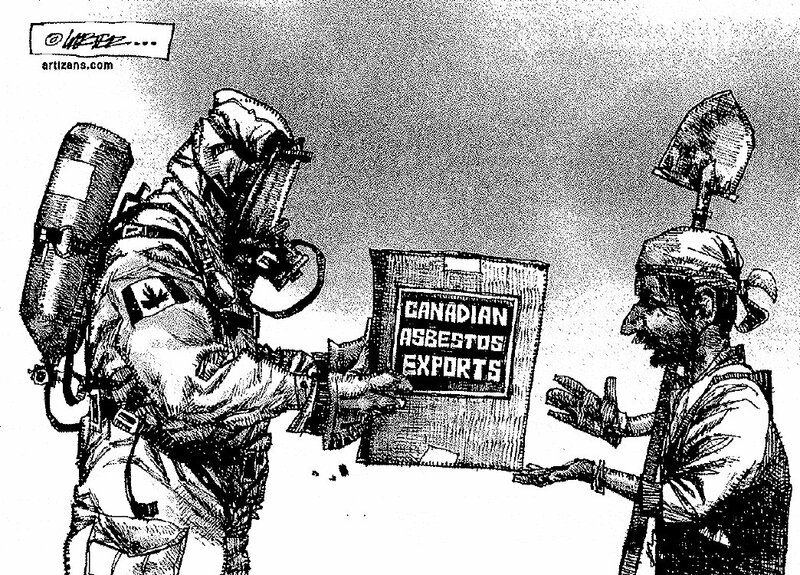 But even when production and use declined sharply in the late 1970s after damaging publicity about the long-term effects of asbestos, Canada continued to produce and export the mineral. Until recently, Canada was one of the world’s largest exporters of asbestos, with the vast majority of Canadian asbestos going to developing countries such as Bangladesh, India, Indonesia, and Thailand, where workers often lack the capacity and knowledge to use the mineral safely. 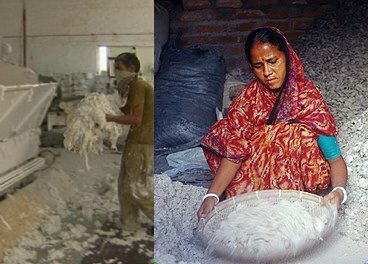 Many workers in developing countries lack adequate protection from the health-harming asbestos fibres. Credit: Sonumadhavan/ICIJ. 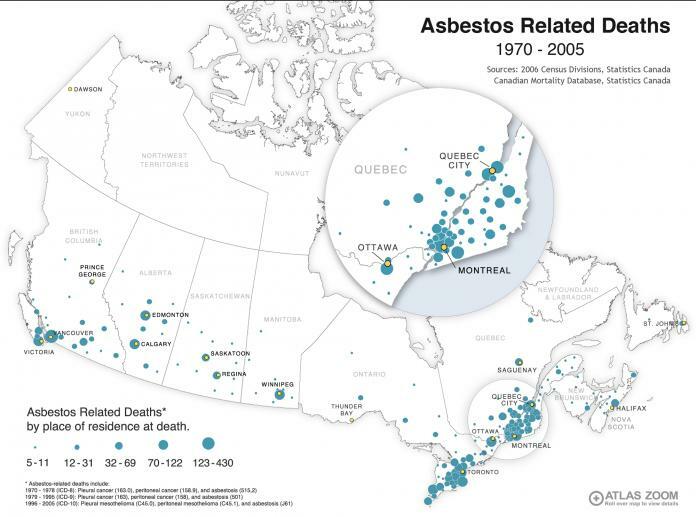 In 2011, the last two remaining asbestos mines in Canada, both located in the province of Quebec, halted production. With the commitment of a $58 million dollar loan from the Quebec government in 2012, one of the mines was set to reopen. However, following a provincial election that resulted in a change of leadership, the new Premier of Quebec promised to cancel the loan and instead use the funds for economic diversification in the asbestos mining communities of Quebec. At this time, the federal government Industry Minister announced that they would no longer oppose international efforts to list asbestos as a hazardous substance under the Rotterdam Convention, which aims to protect those living in developing countries from hazardous substances. The Canadian government also committed financial support for economic development in the asbestos mining regions. While the Canadian government has backed down on its support of the asbestos industry, asbestos mining and export is not banned in Canada. A number of researchers, public health officials, and health organizations have called upon governments to ban the production, export, and use of asbestos. Asbestos is one of the leading causes of occupationally-related cancer deaths. Because it can take many years for the inhaled or ingested asbestos fibres to cause symptoms, most asbestos-related diseases are first detected long after exposure to the mineral. This long latency period makes studying diseases caused by asbestos difficult for occupational health researchers. 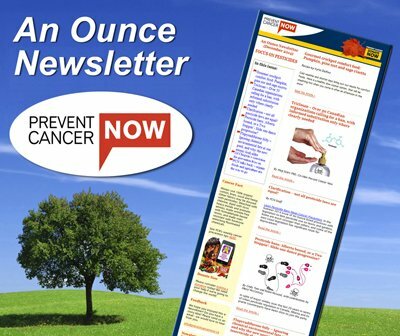 One disease receiving an increasing amount of attention is malignant mesothelioma. Mesothelioma deaths in Canada rose steadily after the 1960s, when workers previously exposed to asbestos began to suffer symptoms and doctors began to recognize the disease. We know now that the average latency period of mesothelioma is about 30 years after initial exposure, but it often ranges from 15 to 40 years. This means that in developing countries using Canadian asbestos today, an increase in mesothelioma deaths can be expected in future. Ruff K. Quebec and Canadian governments end their historic support of the asbestos industry. Editorial. Int J Occup Environ Health. 2012; 18(4):263-267. Canadian Public Health Association. CPHA applauds the Government of Canada on chrysotile asbestos decision. 14 September 2012. http://www.cpha.ca/en/about/media/asbestos.aspx. LaDou J, Landrigan P, III J, Foa V, Frank A. 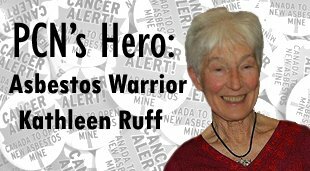 A call for an international ban on asbestos. Can Med Assoc J. 2001; 164(4):489-490. Attaran A, Boyd DR, Stanbrook MB. Asbestos mortality: A Canadian export. Can Med Assoc J. 2008; 179(9):871-872. Lanphear BP, Buncher CR. Latent period for malignant mesothelioma of occupational origin. J Occup Med. 1992;34(7):718-21.